Why are the CIC Branch Association of BC name tags the best anywhere?? Quality of materials: all tags are made with Rowmark Ultra-Matte architectural-grade, outdoor-use-rated, uv-stabilized acrylic; a harder surface to scratch, beautiful surface luster, and white letters and edges that will never become yellow! Additionally, the pin backing is a special low-profile milspec product with pins that are just long-enough to securely hold the tag to a CAF tunic, but not so long that the clips grind into your skin when the tag is worn on a shirt. Topping it all off, both the standard clips and SuperClips are superb-quality brass, made by a respected jewelry manufacturer in North America! Quality of layout: we use a Computer Numerical Controlled (CNC) milling deck that is ultra accurate (to 1/1000") for sharp & precise cutting. Also, the list of your required name tags is imported directly into our CNC program, so zero transcription errors. Quality of fonts: the tags are made with an exclusive European single line font designed to DIN standards. Perfect design and easy to read. Additionally, we have custom-designed (ourselves) additional characters such as the superscript "c" for correct rendering of Scottish names. Got a name with a ton of characters? No problem! We can custom scale our fonts to fit almost any name perfectly onto a 2.5" tag! Quality of finish: all tags are hand finished across all four sides. No burs or uneven edges! Speed of delivery: tags are normally shipped-out within 48 hours of payment (weekdays). An easy, accurate and low-cost service for Canadian Forces and Canadian Cadet Organization members wishing to acquire 100% milspec name tags. Set-up and handling fees are waived for orders of 12 tags or more. $4.00 ea - Includes taxes! Complimentary shipping for orders of 12 or more. A unique feature of this service is the ability to produce tags with accents and original ancestral placements of letters like the subscript or superscript "c", et les accents aigu, grave et circonflex. A custom solid brass spring clip that is extra deep & designed to hold your name tag tight to the front of your shirt or tunic. $2.00 per pair. SuperClips ordered at the same time as name tags will be supplied in addition to the standard military clips. The superior choice for those with tailored shirts (not recommended for tunics) or for members wishing to avoid continually putting-in pinholes! A two-part system: One bar is attached to the back of the tag, and a super-strong rare-earth 3-magnet bar is worn inside the shirt. By flush-mounting to the bottom of the tag, the whole assembly can be easily aligned by placing it right on the top of the shirt pocket....no crooked nametags! MagnaClips are $3.50 per set. They must be ordered at the same time as the tag as they completely replace the standard pin bar. The CIC Branch Association of BC offers an Identity Disc service to both Corps/Squadron cadets and COATS members. Discs are dimensionally identical to official CAF issue and are constructed from high-quality 304 Stainless, with a 30" SS made-in USA chain. $15 per tag, free shipping with orders over 4 tags. Cadets can proudly wear their Identity Disc with a custom "CDN CADETS CDN" engraving. COATS discs will be engraved with "CDN FORCES CDN". Additionally, blood-type engraving is available for COATS tags (the individual ordering the tag assumes all responsibility for the accuracy of the engraved blood type). DO NOT REMOVE/NE PAS ENLEVER on the reverse side. The lower half of the identity disc will be diamond engraved as per the upper half except that the blood group and RH factor and DO NOT REMOVE/NE PAS ENLEVER will be omitted. 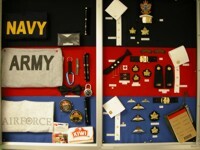 Until 2015, The Regional Cadet Instructor School (Pacific) fully supported a Kit Shop at Albert Head where Cadet Instructor Cadre Officers could purchase uniform accoutrements, branch specific paraphernalia, as well as specialty training items. Revenues from sales by the Kit Shop were utilized to support the CIC Bursary Fund, and from inception to present time, approximately $75,000 was fundraised for the Bursary. Under the present re-organization, and the move to tri-service unified badging and accoutrements, the Albert Head kitshop itself is re-branding with new products and ordering procedures. Enquiries for accoutrement items should be sent by email to: Rex.Ford@forces.gc.ca. Note that name tags and dog tags are still being supplied by mail order directly from the Branch Association and not from the Albert Head Kitshop.